The Physical Therapy job market is experiencing significant growth, to the tune of 25% according to the Bureau of Labor and Statistics. That means more therapy job opportunities, and more therapy job interviews. Here’s the thing about job interviews: it doesn’t matter if you’re a new Physical Therapist or if you’ve been in the clinic for 15+ years. 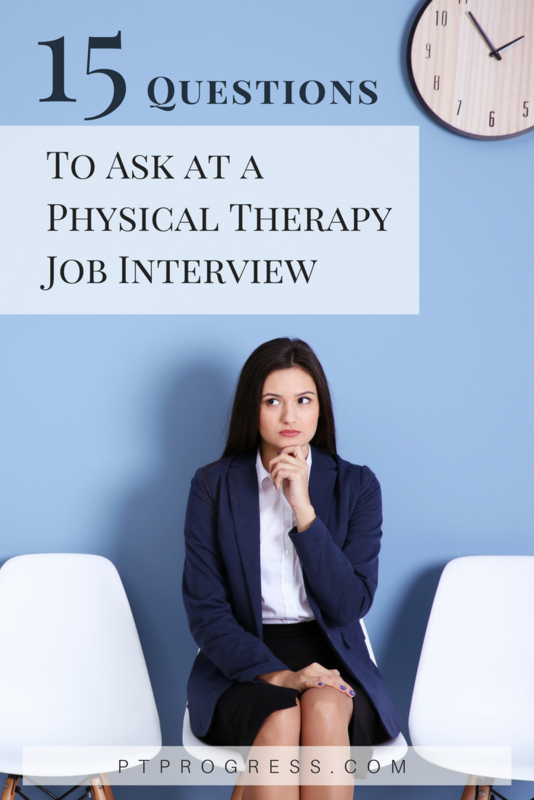 A successful Physical Therapy interview will result in a good hire and the right fit for the clinic and therapist. An unsuccessful interview can result in the following: miscommunication, poorly set expectations, and even resentment down the road. Let’s avoid this, shall we? You can almost guarantee the employer will have a set of questions to reference while interviewing you. It keeps them on track and helps them to draw out the right information so they can make the best decision possible. That’s exactly why you need to have a list of questions to ask during your interview. Can you walk me through a typical day for one of your therapists? You’re trying to figure out the daily expectations the clinic manager here. Keeping the question open ended will give you more insight into the position and their expectations. How are some of the other therapists using their strengths in the clinic aside from treating patients? This question helps you to know a few very important things: Do employees wear multiple hats in the clinic? Does the manager recognize and value employees who go above and beyond their job responsibilities? If you want (or don’t want) an environment that strongly encourages therapists to take on roles outside of patient care, this is a great question to pull out during your interview. How long have you been a part of the department? What about the other therapists? Is the team relatively new (<5 years) or well established and “seasoned.” This question is more important that you realize. As a new hire, joining a team of therapists who all have less than 5 years with the company can mean high turnover. On the other hand, joining a team with therapists who have been there for more than 20 year can be a challenge in itself as you may experience pushback from them if you bring in new ideas to the clinic. Why did this position become open? Is the clinic growing or did someone leave recently? Use this question to draw out the need behind the job listing. They obviously need you to fill the role, but what brought them here? What are your biggest goals for the clinic this year? This question will reveal the manager’s priorities for the clinic as well as give you an opportunity to sell yourself. Highlight your strengths and reference how your experiences and skills can help meet the department goals. What is the probationary period for this position and what does it involve? What is the typical onboarding process like in this company? Are you taking over someone’s established caseload or will you build up your caseload gradually? What about training with the current EMR? What EMR do they use? As you can see, most questions lead to 2-3 others, but the idea is to be conversational, not interrogating. What are the productivity standards for therapists in the clinic and how are those measured and tracked? Nothing worse than finding out that your employer “really encourages” an average of 4+ billed units per hour. Are they double booking? Triple booking? Do they have techs leading exercises while you are expected to treat 2-3 patients an hour? Find that out now. How much time is allocated for patient care – evaluations and follow up appointments? Some clinics give the therapist significant scheduling autonomy, while others manage the schedule without any PT input. It’s good to find this out early. How do you measure performance through performance appraisals, goals, or other metrics? Some clinics follow a regimented performance appraisal system. This usually isn’t a deal breaker, but it is a red flag if the clinic “doesn’t really do performance appraisals.” You can’t expect to grow individually (or as a company for that matter) if you don’t measure your performance. Staying up to date with my clinical skills is important to me; what value is placed on continuing education at this clinic? The answer to this question will give you insight on the clinic’s continuing education budget and view on employee development. What are the hours/days you are looking to cover with this position? 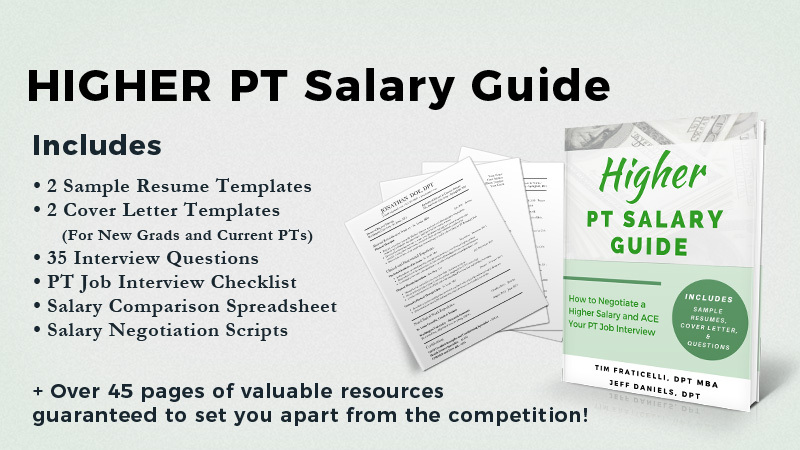 It’s very common for a PT shift to be flexible with varying hours or even four 10-hour days. 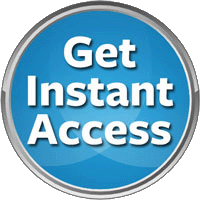 So be sure to ask what hours they are looking to cover – if they are hesitant to commit to the days/hours, be hesitant to accept the offer. I have questions about the compensation package: is this a conversation we would have in a later meeting or do you have information to share today regarding benefits and pay? *Some employer are mixed about interviewees asking about compensation during the interview. Hopefully you will get a feel about this during the interview, but be prepared to ask the question tactfully. What are the biggest opportunities or challenges facing the clinic right now? You’re looking for the good, the bad, and ugly here. Often times, interviews will highlight the positive elements of the job or clinic. Do your best to draw out the challenges the clinic may be facing. 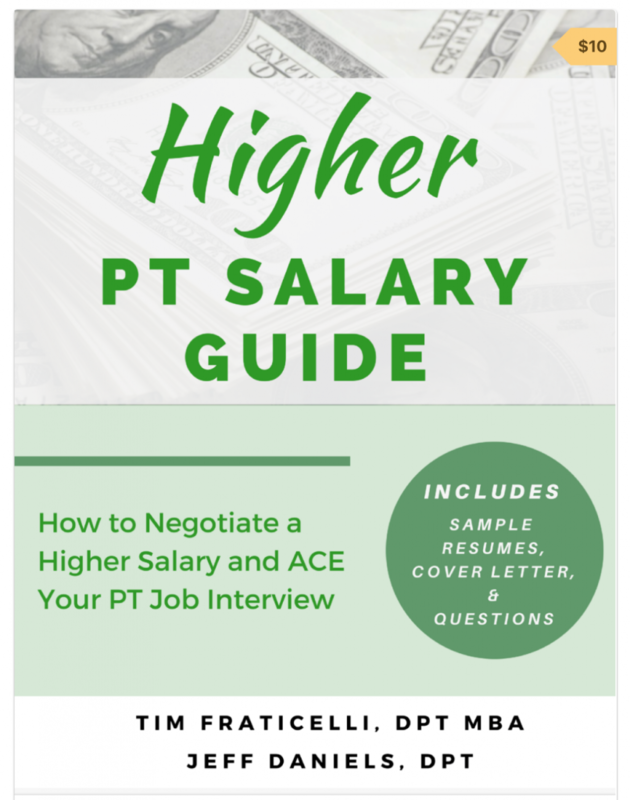 You might be able to use your strengths to help solve these challenges, which makes for a great point in negotiating a higher salary. What reservation do you have about hiring me for this position? This gives you an opportunity to clarify something they might have questioned during your interview or an experience you’ve listed on your resume. Regardless, it’s a good question that brings the interview to a close and leads to the final handshake. What questions do you suggest asking during an interview? Better yet, what questions do you wish you would have asked before your most recent interview?